Who? Anyone! Suggested $5 Donation, you won’t be disappointed. What? 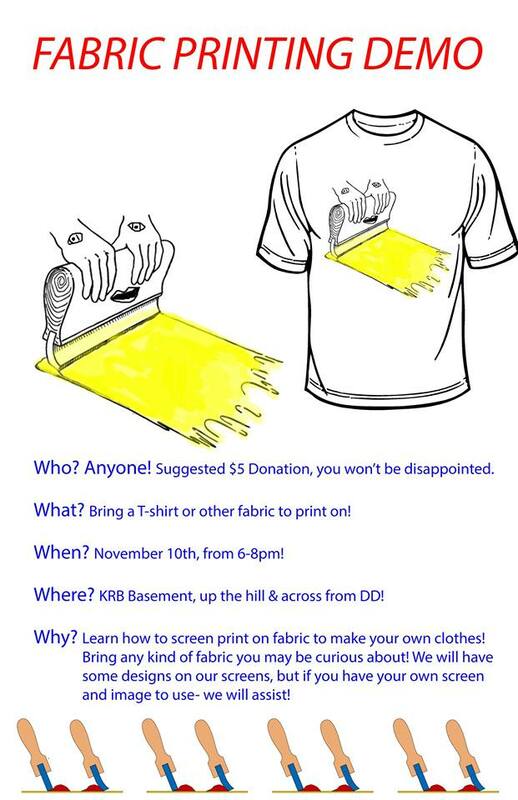 Bring a T-shirt or other fabric to print on. Also, there will be snacks! When? November 10th, from 6-8pm. Where? KRB Basement, up the hill and across from Dunkin’ Donuts. Why? Learn how to screen print on fabric to make your own clothes! Bring any kind of fabric you may be curious about. We will have some designs on our screens, but if you have your own screen and image to use- we will assist.